This 45 is the only one she recorded but it’s a fine legacy indeed. 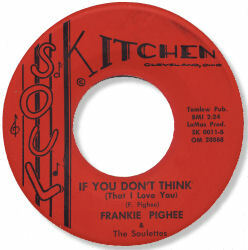 Taken at a slow, slow pace, Frankie really sings her heart out over her enduring love. The churchy organ and girl chorus only add to the depth of the feeling the song generates as well. Can’t get enough of that tolling bell either! Thanks for this one Frankie.